FREE 60’s Go-Go Dance Class! Prior to the launch of our new and exciting course we are running a FREE 60’s go-go dance class. Prepare to travel back to the psychedelic swinging 60′s and transform yourself into a go-go girl and learn some classic moves including the pony, the monkey, the stomp and of course the famous twist! This upbeat, fun and unique dance style is a great way of improving fitness with lots of shimmy’s and shakes and a great excuse to dress up in 60’s attire and travel back in time! Monday 28th March 6.15pm – 7.00pm @ The Dance Studio, Cotham School, Cotham Lawn Road, Bristol BS6 6DT. The Showgirl Academy at The Valentine Charity Dance! Valentine Charity Dance Event in aid of Muscular Dystrophy Campaign. The event will be a 1920`s fancy dress Jive dance featuring a fund raising raffle and a cabaret from The Showgirl Academy (20’s Charleston & Can-Can) and Hoppin Mad (Lindy-Hop). A fun night full of flappers, fun, fancy dress and non-stop dance! Gareth Rees, 189 Mackintosh Place Roath Cardiff CF24 4RP. Looking for the perfect way to banish those post-Christmas blues and shape up for the new year? Following the phenomenal success of the burlesque workshops in the run up to Christmas, World Jungle has teamed up again with The Showgirl Academy to deliver a one-day spectacular workshop to learn the Can Can! Spring Special – BOGOF Offer! 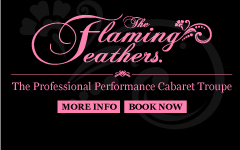 The Flaming Feathers SHOWGIRL SPECTACULAR!